Sleep is a necessity, but sometimes we don’t always feel satisfied when our alarm clocks go off in the AM. Tossing and turning or letting stress get the best of us can lead to a less than ideal night of “sleep.” Maybe you wake up sore or stiff, either by your super firm mattress or your inability to stay on your side the whole night, waking up with your arm crushed and your neck in an awkward (and slightly embarrassing) position. This, my friend, is where the body pillow comes in. Our organic body pillows are made for side sleepers who are looking for some extra comfort. Here are five ways the body pillow can seriously upgrade your sleep experience and get you into a much-needed healthy routine. It’s easy to aggravate your pressure points when your mattress is too firm. Your hips are sensitive and when they don’t feel properly supported, this can lead to discomfort and pain. Your body responds by shifting your sleeping position, most likely so that you’re now partially on your stomach or twisted in the arrow position. The result? Improper spinal alignment and excess pressure on your arm since it’s probably squished underneath your pillow and feeling a little bit numb when you wake up. This is especially an issue for people with wide shoulders since they’re more likely to twist and lean their shoulders forward, even folding their pillow in half in order to try to get more height and support. The body pillow takes care of this for you with its elongated and full shape. By placing the pillow along your body and in between your knees, you have something that will keep you aligned instead of falling into an uncomfortable position. The body pillow takes pressure off of your hips and therefore helps your body relax. No one wants to have a full-on workout while they’re trying to fall asleep and that’s exactly what tossing and turning can feel like. When your body feels uncomfortable, it becomes restless, trying to find a proper sleeping position. When you’re holding onto something supportive though, you have less of a tendency to move. It’s a comfy, cozy miracle. Now, I know what you’re thinking: Why can’t I just hold onto my partner? Unlike a body pillow, your partner produces body heat which will in fact make it more difficult for you to fall asleep. Your partner’s movement may also disrupt your sleep. So, while your partner may be cute and cuddly, they need to move over for the body pillow. By incorporating the body pillow into your nightly routine, you’ll train your brain and body to view the pillow as a symbol of relaxation and comfort. Just like brushing your teeth and washing your face signal that it’s time to wind down for the evening, the body pillow will encourage and promote a restful sleep. A nightly routine is critical when trying to lessen tossing and turning. We all love hugs (well, most of us) because of their instant comforting effect. A hug makes you feel safe and happy. Holding onto a body pillow at night can replicate this sensation and create a sense of peace as you doze off. The emotional element associated with hugging and holding allows your mind to stop racing, instead focusing on the quiet around you as you relax your muscles. 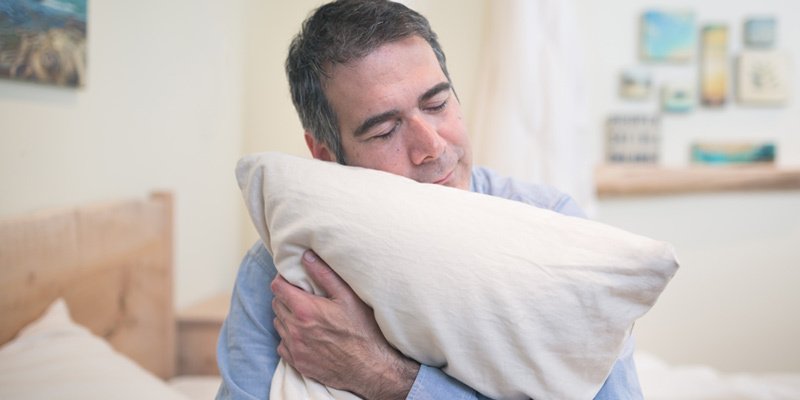 If you struggle with getting your mind to shut off when you’re trying to get comfy and cozy under the sheets, hugging a body pillow may be just what you need. Holding onto a stuffed animal as a child turned off that energetic light switch and helped you fall asleep. A body pillow has this same effect except it also helps you stay in alignment (and it’s less embarrassing than a stuffed animal). When you’re lying on your side, the entire body weight of your upper torso is pushing on your hips which can sometimes cause discomfort and pain. When this happens, your leg slides forward, causing you to twist and put pressure on your back. A body pillow allows you to relax your muscles and stay in proper alignment. By placing the body pillow between your knees and hugging it as you sleep, your body will not feel the need to twist because your weight is evenly distributed. This is why the body pillow is so helpful for people with back issues. Savvy Rest is all about customization. That’s because we’re all different heights and weights and we all have unique pains, injuries and needs. Our mattresses are customizable so of course we wanted to create customizable pillows as well! Unzip the inner organic cotton casing and you’ll get a first look at the natural fill inside. Take out as much of the fill as you want until the height and weight of the body pillow is exactly how you want it. 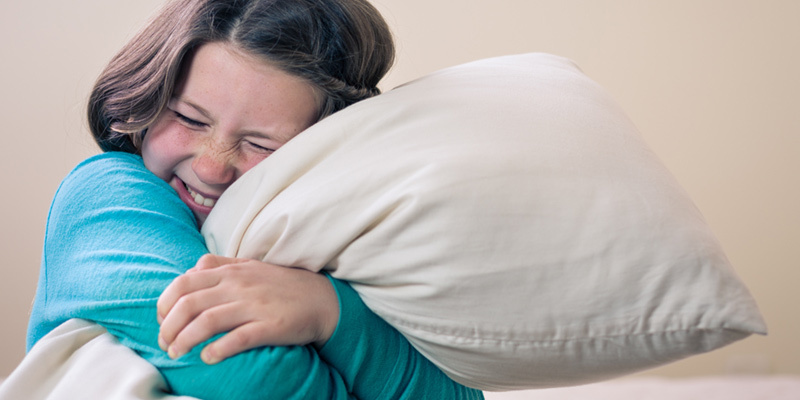 A petite person for example may want to take out a significant amount of fill so that they can more easily hug and wrap their leg around the pillow. Here’s a tip though: Always keep your extra fill so you can add more later on if you feel the need. 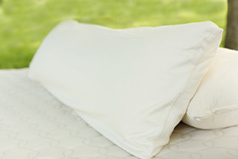 Our body pillows come with unbleached, organic cotton casings that are soft and safe for you and your family. You can choose from our various natural fills, such as wool and kapok. We wanted to create a product that positively benefited our customers’ health through both functionality and composition. It’s not enough for a body pillow to keep you aligned. It must also be made with high quality and natural materials. Savvy Rest body pillows are a healthy addition to any home. We hope you give one a try! For pregnant or nursing mothers, there are many benefits to using an organic body pillow. Here are just a few.